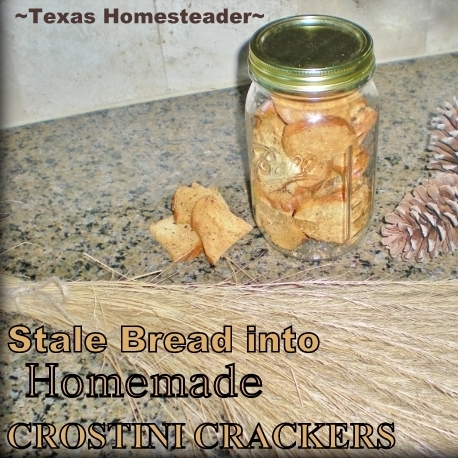 Crostini Crackers From Stale Bread - EASY & QUICK! I don’t know why I have such a drive against food waste. Of course no one likes to WASTE food, but it’s almost an obsession for me to make sure no food goes to waste. I never ever remember going hungry a day in my life so I don’t think it’s an emotional scar of any kind. I know it’s good for the budget to use all the food you’ve already purchased, And I know that not buying more food to replace what you’ve had to throw away is good from an environmental standpoint too. So maybe there’s where the secret to my obsession lies. In any case, my wheels were turning on what to do with this stale, rock-hard yet expensive artisan french bread. I KNOW – I’ll make crostini crackers! RancherMan loves all things bread including crackers. So making my own means I won’t have to buy them. Crostini is similar to a thick cracker and it’s so easy to make with crappy stale bread. Here’s what I did: First I pulled out my meat slicer. 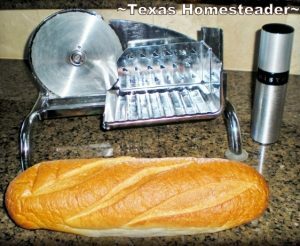 You could just cut it with a knife but this bread was pretty hard and the meat slicer will make all the slices uniform – I like that! Then took the bread and sliced it into roughly 1/4″ thick slices. I felt the bread slices left whole would make the crackers a little large. So I cut each one of them in half – perfect! Then I laid them out on a baking sheet and used my * MISTO sprayer containing olive oil to lightly spray each piece of sliced bread. Finally I sprinkled on some garlic-mix seasoning and gave each piece a light spray of olive oil again to kind of adhere the spice to the bread. You could season with whatever dried herb you like. Next I plan to use some of my dehydrated oregano to add an Italian flair. Now that my bread is oiled & seasoned I put the baking sheet into a cold oven, set it to bake @ 400 degrees and then watched for the bread to be toasted to our liking. In my case I baked them for 13 minutes and then turned off the oven & left them in for another 2 minutes to let them dry out in the residual heat. This all depends on how thin you slice your pieces and how much olive oil you use, etc. So be watching & be ready to pull them when they’re toasty brown. Then I pulled the crostini out of the oven & allowed them to fully cool before storing them in a couple of wide-mouth canning jars. They should last at least a couple of weeks although they never hang around here that long – RancherMan loves them! These work great as a little appetizer when I serve my version of Homemade Hummus. They’re also good topped with such things as ham & cheese, or guacamole with chopped tomatoes & jalapenos, almost anything! RancherMan loves to snack on them right out of the jar. But they’re also great with dip, chili, almost anything you eat that is well accompanied with a thicker hearty cracker. So in no time I’ve saved bread destined unloved for the compost, and made it into a very well-loved cracker. And I say you’ve just got to love that! * A word about our Affiliate Link – We are currently enrolled as an Amazon Affiliate. Occasionally I will insert an affiliate link into one of my posts if I think it may be of interest to you. I receive nothing from the manufacturer, but I love my sprayer & thought you might too. If you click on any of my affiliate links and buy something (almost anything, not just what was linked) I get a small referral percentage from Amazon. But here’s the really important part – the price you pay for your items is UNCHANGED. This entry was posted in Blog Posts and tagged Environment, Frugality, Make-It-Yourself, Recipes on November 29, 2013 by Texas Homesteader. I hate wasting food too. We don’t normally have bread leftover (we love our carbs), but I always have ends left and I like to make bread crumbs from them. I’ll have to try making my own crackers if we ever have bread leftover. Another great idea! I am also anti-food waste (and yes I do have that reputation that if you put it on a plate at my house, it must be consumed 🙂 ) Thanks for sharing this on the Art of Home-Making Mondays. I can see my hubby liking this too! Oh I wonder if you could make croutons out of that bread also. I love the fact that you find uses for food that would otherwise be thrown away, thanks for sharing once again on Tuesdays With a Twist. I’m with you and hate wasting food (and I’ve wondered why I have such an obsession, too). Thank you for linking to the In and Out of the Kitchen Link Party. I look forward to seeing you next week. Clever way to use that stale bread! Thanks for always having great ideas and sharing them at TTF! Thanks for sharing on Independence Day Challenge. I, too, have an obsession about not wasting food, so I am always interested to learn how other people make something appealing out of what might have gone to waste.